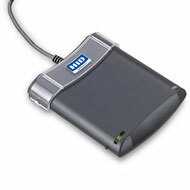 Housed in a robust closed housing with a convenient card retainer, the HID OMNIKEY 5321 CL USB represents the ideal reader for contactless technology applications. Featuring a PC-linked reader that reads/writes to 13.56 MHz contactless smart cards in all three HF standards, the OMNIKEY 5321 CL USB economically supports end-user environments where a variety of contactless cards and tags are used. Utilizing contactless smart card technology for PC-linked applications, the OMNIKEY 5321 CL USB device allows users to experience the convenience, speed and security of contactless technology for applications, including logon to Windows, networks, web sites and applications for the secure storage of user names, passwords and personal information.